Anyone reading the usually-reliable Nicolas Rothwell in The Australian newspaper a couple of weekends ago (The Review 22/23 March) in a major essay entitled 'Culture War', would have come away convinced that an exhibition designed to reveal the extent of the 900 kilometre Ngintaka Tjukurpa/Songline as it meanders through the Western Desert was a serious breach of Indigenous cultural protocols, with a group of elderly Traditional Owners (TOs) of the Tjukurpa sorely distressed. Indeed, both the SA Museum - hosting the exhibition – and the SA Supreme Court took the article and the distress so seriously that it looked as though the show would be denied an opening, and conceivably then shut down by court order. At the end of a tense week, though, this threat was lifted – to the delight of the many artists, TOs, art coordinators and anthropologists who'd spent the past 3 years attempting to make sure that everyone at the seven art centres across the Anangu Pitjanjatjara and Yunkunytjatjara (APY) Lands was comfortable with the exposure of all the public elements of the Songline. Everyone, that is, apart from Yami Lester, the blind, Woomera atomic bomb-testing victim from Wallatinna. He'd let The Australian know a year before that he wanted no part of this exposure – causing a check to be made of all the other communities on the Ngintaka's travels as to their continuing enthusiasm. And enthusiasm there ought to be for a project which has the potential to bring some of the complexities of the oldest surviving culture in the world in from the deserts to institutions like the SA Museum and, hopefully later, the National Museum in Canberra. It may be unfashionable in the Aboriginal art world to say this, but I believe many buyers of the apparently abstract canvases from tribal Australia do so in part from the belief that there's an unfathomable meaning that lifts them far above the drips and splashes of Western abstract art. They don't need to know all the details, but they do want the sense of the numinous that an exhibition like 'Ngintaka' offers. Indeed, I think there should be a permanent institution in every capital city that offers such opportunities to locals and tourists alike. The art market will only gain from such insights. In this case, the story really matters more than the art. 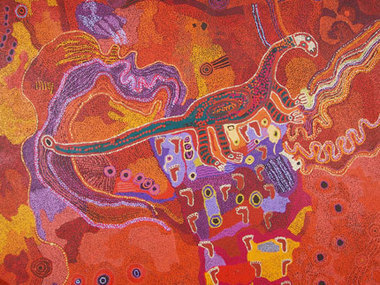 The Perentie Lizard Man, Wati Ngintaka is a Creator Being from the Dreamtime – ancient myth and living legend : “My father's grandfather is the Ngintaka” declares David Miller, “speaking for my father's Country near where the Ngintaka threw the seed away”. Miller is also Chairman of Ananguku Arts, the body that advises and brings comfort to the APY Land's seven art centres. For, as with so much Aboriginal lore, this is not just a moral story. It's a practical one relating to the water nomads needed to survive in the desert, the seeds people ate to thrive, and the trading of the best grindstones in order to make those seeds edible. I'll attempt a brief summary of the Ngintaka Story. The Perentie Lizard Man (Varanus giganteus) is living near Irrunytju, just over the border into WA today – and there's no decent sandstone for hundreds of miles to make a grindstone which will sift out all the chaff from the seed needed to make a scrumptious seedcake. And it's a man's job to supply his wife with a good grindstone. So, when he's hunting further east, and he hears on the wind the magical sound of a perfectly smooth grindstone, the Ngintaka knows what he must do. Find it, and steal it! Four hundred and fifty kilometres from home, he eventually tracks the sound down – at Wallatinna, home to distant relatives, the Nyintjiri or Black Lizards. Eventually, he gets to taste the perfect seedcake – which slips down without touching the sides. It's so good! Cunningly, the Ngintaka then injures his foot so he can't go out hunting with the men or gathering with the women – and swallows the grindstone so completely that when the Nyintjiri catch up with him time and time again during his journey home, they can't find it. That return journey is much more significant than the original hunt for the grindstone; for every stopping place seems to have been recorded and many of them involve sites for increase ceremonies - the Ngintaka's role having been to introduce various seeds and berries into the landscape by over-eating on them and then sicking them up. Part of a tribe's responsibility for Country today is to head out as Spring arrives to rub the rocks associated with each food source left behind by the Perentie. Back at the Songline's turning point in Wallatina, the giant Perentie has disguised his escape route by creating a rainstorm – and the Ngintaka Inma dance today involves a headdress of clouds – and has magically changed his size so his footprints aren't identifiable. But much of the detail has to be missing from the exhibition because of Yami Lester's resistance to showing any images of his Wallatinna part of the story. Lester's own 1993 autobiography, on the other hand, had told the whole story without seeking permission from its more Westerly rights-holders. But these TOs can now tell the whole story – it's been in the public art domain since 1974, and the APY Lands Council approved a recording of the Inma in 1995. In fact, way back in 1940, Moanya, the scion of the Brady family who've been keenly involved in this project today, told anthropologist Charles Mountford the story, allowing the academic for the first time to recognise the essential link between Country and myth. The perspicacious Moanya, in return, recognised “the white man with his flour is killing us”! Unfortunately, Mountford couldn't resist publishing photos he'd taken of the Ngintaka sites along the Perentie's homeward route in his last work, Nomads of the Australian Desert without permission, resulting in legal action by the TOs in 1976, which got the book banned. Greater care has been taken this time by ANU anthropologist Diana James, Ananguku CEO Liz Tregenza and the fifteen male TOs who've been backing the project – itself part of a bigger Songlines Project involving the National Museum. And while Nicolas Rothwell presented his case basically as one of the old men feeling that they were losing authority to both Desert women and 'White do-gooders'; going so far as to quote the saintly Hector Burton as saying, “These (Aboriginal) women doing this exhibition aren't our sisters. They're white not black. They have another skin. Go back to the other side of the sun. Don't interfere and take what's ours”. Accompanying this brutal statement of denial is a moving picture of four old grey (and white) beards sitting proprietorially in the long grass at Amata with the Musgrave Ranges in the background. They are the lawmen and artists, Mick Wikilyiri, Hector Burton, Willy Kaika Burton and Ray Ken. But, as Diana James pointed out to me, all these man seem to have come to their negative views only after Rothwell visited the community. “They changed their minds after a visit by Rothwell, who then wrote an article claiming the men at Tjala Arts had drawn a ‘line in the sand’ against the Songlines Project. Rothwell’s claim that Mick Wikilyiri is against the Ngintaka exhibition is particularly mystifying as Wikliyiri insisted on being recorded on film telling the Ngintaka story for the exhibition when the Songlines team travelled through Amata in July 2013. Wikilyiri’s wife Paniny is a senior traditional owner born at Arannga where Ngintaka dies. Her painting is in the exhibition and she supports the Ngintaka project”. And, as Wikilyiri's health has subsequently declined, the photograph of Mick in The Australian cannot be a recent one. Both of the Burtons, James points out are Owners of the Caterpillar Dreaming, not the Ngintaka. And when a meeting was held as recently as 6 March at Amata, the Burtons and Ken had no serious cultural concerns about the project, raising only the ancient Biblical concern as to whether contributors had sold their birthright for a mess of pottage. But all this name-calling by one side has produced equally vituperative responses by the other. In a scorching statement on the eve of the project finally being realised, Yami Lester described the Nigintaka Project as unethical and a "Trojan horse into forbidden ground". Michael Williams, “who has great authority on the APY lands”, according to The Australian, supported him, saying Mr Lester is "fighting for his land and Tjukurpa (Dreaming)". And the response by the Project's TOs: “Yami Lester may have some authority to speak for a small area around Wallatinna. Michael Williams may have a link through family, but his birthplace is elsewhere and we have told him in a previous meeting at Amata in 2012 that he has limited knowledge of the Ngintaka Tjukurpa”.Take that! 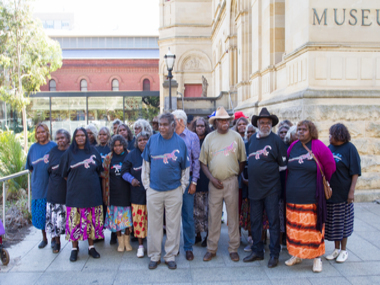 Despite this, the Council of the SA Museum had to take a legal letter on behalf of a body calling itself the APY Council of Elders seriously – postponing the opening until just two and a half hours before it was due to happen. As did the SA courts, which placed a temporary injunction on the exhibition's videos and opening Inma – though too late for that; the dance had triumphantly taken place. Over the following week the Council of Elders was discredited as a responsible body compared to the APY Land Council, particularly, its Law and Culture sub-committee. And the concerns of the Council of Elders members regarding the videos were addressed by letting them see them. “By Friday, we were vindicated”, Diana James exulted. We have to see these events in the context of various other exhibitions, starting with the unfortunate 'Icons of the Desert' in America, where a variety of non-Indigenous-sourced interpretations were placed on early Papunya boards, and Alison Anderson (Rothwell's partner), then the NT Minister responsible, declared that “white people are stealing our culture because they have none of their own”. Subsequently, the NGV with 'Tjukurrtjanu', covering the same art history, and 'Ngurru Kuju Walyja' (the great Canning Stock Route show at the NMA) have taken inordinate care over their interpretations of artworks. 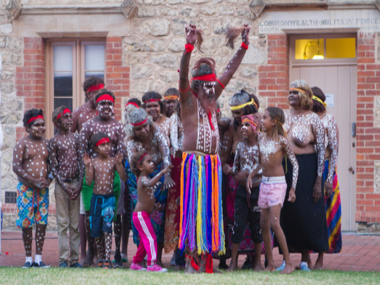 Which is exactly what was attempted with Ngintaka – and its partner project, the Seven Sisters Songline exhibition, which has been postponed until 2017 because its extensive coverage of the country from the Martu in the far West, across the deserts into the lower NT, requires much travelling, filling in of gaps now uninhabited, and diplomacy. But how important it is to get as many levels of these stories as is appropriate out into the wider world. So I questioned Diana James about the wacky morality of an oft-repeated legend that begins with greed, is followed by theft and ends with the 'perfect' grindstone being smashed and its abductor killed; was this something like white Australia's Gallipoli legend with its capacity to extract national character from death and defeat? “I see so many parallels to the Hindu and Greek gods”, she responded; “humans writ large, naughty and arrogant. But also essential for bringing humanity rain and seeds; and the Ngintaka was such a clever man that his opponents could never find where he had hidden their grindstone”. In conclusion, I find Nicolas Rothwell's bald assertion that the APY women are “ritually subservient to the men” - and therefore should bow to their will in such matters as the Ngintaka Tjukurpa – so powerfully denied by the Story itself. For, as archaeologist Mike Smith points out in the exhibition catalogue, the clear message behind the narrative is that APY men and women were inter-dependent – the men needed to develop both the technology and the trade routes to supply the grindstones for the women to use to produce the necessary sustenance from the seeds they'd gathered. This scientific line in the sand brought the recent ABC TV series 'First Footsteps' back to mind. That series of encounters between the Tjukurpa of variousTraditional Owners and the science of archaeologists and anthropologists is such an effective way forward in our fuller appreciation of the First Australians. News Categories: Australia | Blog | Exhibition | Feature | Industry | News | What's on?